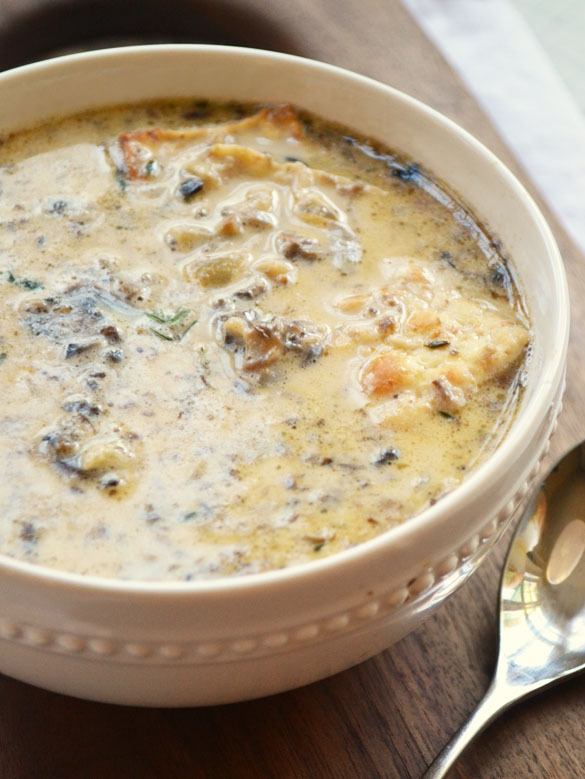 Ham is divine in mushroom soup - if you have a chunk left over, chop it and stir it in along with the mushrooms. Or if you have a ham bone, simmer it in the soup. 1Heat a drizzle of oil and about half the butter in a pot set over medium-high heat. 2Add the onion and cook it for a few minutes, until it's soft. Add the garlic and cook for another minute, then the mushrooms, the rest of the butter, and pull the leaves off thyme off their stems and add them. If you like, add some chopped ham, too. 3Cook until the mushrooms get soft, then the moisture cooks off and they start to turn golden. Shake the flour overtop and stir to coat the mushrooms with flour. If you like, add a splash of sherry or white wine, and let it cook off. 4Add the stock and bring to a simmer. Cook for a few minutes, until smooth and thickened, then season with salt and pepper and stir in the cream. Serve over buttered crackers. I made this for supper last night. Super delicious. Quick and easy to make. Thanks for a great recipe!